Looking up makes us try harder. of the things worth trying for. Intelligence shouldn't intimidate, it should inspire. If it is intimidating, maybe it's the wrong kind. and let other people grow to their potentials. even after they seize to exist. It's called 'things you can(t) control'. I spent the day reading about history and the modern world. I found out that 62% of the world's Muslims are Asian. Yet what is perceived as Islam by the world are those of Arabic culture. We are under-represented, if not misrepresented. Another thing I learned is the underlying difference between Sunni and Shia: Sunni believes in the Sunnah and Shia believes in the rightful figure of Muhammad's successor (Ali)). 85% of the world's Muslims are by definition Sunni. We can go into a long theological debate, but I want to focus on one thing. The media is focused on portraying a linear, monolithic Islam that is culturally homogeneous (Arabic) and dogmatic. See Hollywood films, see how the news represents Islam (e.g. terrorism, turbans, veils). I am not suspicious and puritanical enough to claim it's a conspiracy but it's naive to not think that it comes from ignorance about the characteristics of the larger population of Muslims in the world. I have high hopes that the world is changing, by means of the notion of pluralism and democracy, at least. An example is Esposito and Mogahed's book on Who Speaks for Islam? and Mogahed's subsequent appointing as Obama's advisor for Muslim affairs. I am not saying that the 'pluralist' Muslims are better than the rest. I am saying that the current media representation does not provide a comprehensive picture which may lead to bigotry. I know I'm late in jumping the wagon, what with Edward Said's Covering Islam in 1997, but I do think it's still an ongoing process worth prolonging the discourse. For all citizens of the world wishing to live peacefully in general and for the silent majority of Muslims in particular. Everyone deserves to be heard. Let's listen. I wish I could express myself in writing in Bahasa Indonesia as fast as I can write in English. I am not a native English speaker and I am Indonesian. 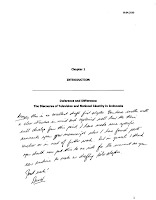 My thesis is about Indonesia. And yet, when it comes to expressing myself, I do it faster in English. Words pour out of me. I do not stutter in finding the right word as I do in Indonesian (Embrace? Merengkuh? Memeluk? Carry? Bopong? Gendong?). I read one of one of my students' blog and I am in awe with his grasp of the language. I don't have that linguistic connection to be able to retrieve words like sekelindan, derau, sangkil, meracau to explain myself in writing (or verbally, for that matter) as many journalists and academics do. The first language I learned was English. My parents brought me to the States when I was 2 years old or so and returned 3-4 years later. I couldn't speak a word in Bahasa Indonesia. So maybe that's why. But I wasn't raised in an English speaking country as an adolescent. I'm stuck in an intermediate level of English. So it's not exactly ideal in terms of being an English speaker either. Alas! I am a student and I will learn how to. 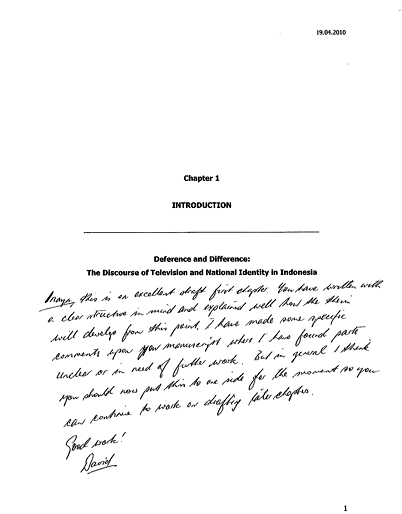 I promise, when I finish my thesis, I'll sit in a Bahasa Indonesia literature course in FIB, UI and learn how to write in advance Bahasa Indonesia. PS: I can't even bring myself to write this post in Indonesian. I tried and it felt superficial. Terkesan meracau (ha!). by trying to get people interested in you. There was a period in my life where I was a horrible student. All through my high school to the first years of university. I was the student sitting in the back of the class, reading another book that had nothing to do with the subject. The one who skipped a period pretending to have an ulcer, because I didn't like the teacher (and the subject). The one whose single achievement was winning the essay competition on what's wrong with Indonesia's education system (ha!). I've always seen it as 'the dark ages', a phase where I wasted a lot of time; a time where I should have been more focused and determined. I see some of my students who embody that ideal. They move fast, know what they need to achieve in order to progress further in their career. I smile upon their potential and promised success, because I know they will be better than I will ever be. I was having yogurt with my 20 year old brother one day when we were talking about my PhD and the fact that I'm 27. I: Tapi ada lho mahasiswa yang dapet beasiswa yang sama kaya aku, umurnya 25 wew. I: Ya lulus SMA langsung S1. Lulus S1 langsung S2. Lulus S2 langsung S3. Z: Ya tapi kan dia emang rajin, Ka. Kaina kan sempet males-malesan banget, terus mutusin mau usaha dan berubah. Dan akhirnya sekolah dan sampe kaya gini. I pondered on his argument and the logic behind it. I guess it really is a personal journey. Life shouldn't be seen as a string of results, but a test as to how hard we try. It's not that other people are better than us or the other way around. But how we surpass the trials we face in life and come out a better person. A better person than we were yesterday, not a better person than somebody else. When seen through this perspective, then my so-called 'dark ages' are not dark at all. It was a period where I questioned who I was when I was 17 and the education system did not give me answers. If it weren't for reading those philosophy books and reorganising the way I saw life, I would not be the person I am today. So all those mistakes, all those regrets, when seen from this perspective are the aspects that mold us into more conscious human beings. And it makes sense now, why I don't (well, rarely) compare myself to other people. Even if they're smarter, have achieved more, if they're wealthier or if they're salary is twice mine. Because life isn't a competition. It's a journey, for every single one of us, to learn how to 'work our way around life'. It's never about the quantity of success, it's the quality of how these things make us better people. So let some people be more 'quantitatively fortunate' than others, because quality then becomes relative to each person. After all, life is not about what we have, but what we do with what we have.